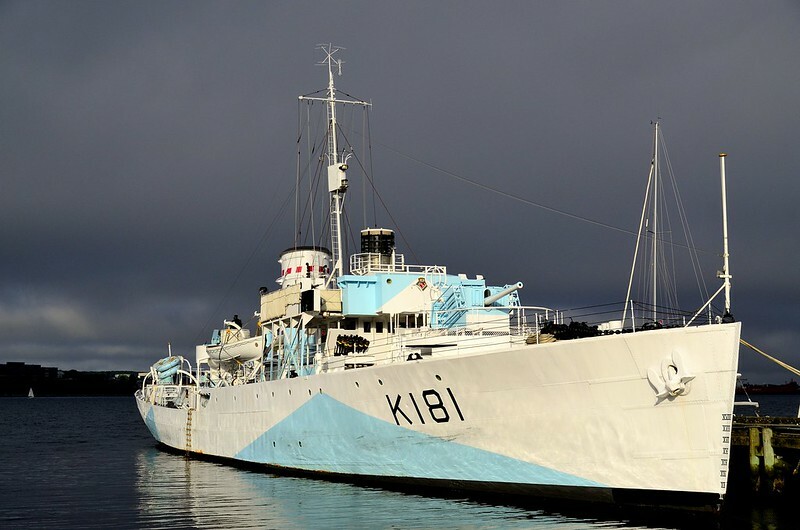 The HMCS Sackville was laid down in early 1940 and was 1 of 267 Flower-class Corvettes built for the Allied navies during World War II. The U-boat threat to the Atlantic shipping lanes required hundreds of small, nimble ocean going warships to fend off U-boat and Luftwaffe bomber attacks on Allied convoys. The Flower-class were intended to fulfill this role and helped get American and Canadian men and war material across the Atlantic safely. The Sackville first saw service in early 1942 when she was deployed to the Northern Atlantic to protect convoys off the coast of Newfoundland. The ship damaged several U-boats during her wartime patrols and even forced two U-boats to completely break off their attacks and return to occupied Europe for extensive repairs. Unfortunately, the Sackville was herself damaged in August 1944 when a massive explosion damaged one of her boilers. The cause of the explosion is still unknown, but was most likely the result of one of her depth charges exploding a Nazi torpedo close to the Sackville’s hull. Relegated to harbor duty the ship was later converted into a research vessel for use by the Canadian Department of Marine and Fisheries. Finally retired in 1982, the Sackville avoided the scrap heap and is now the last remaining Flower-class corvette in the world. She now continues in service as a museum ship and Canada’s Naval Memorial in Halifax, Nova Scotia. The ship can be visited during the summer months and more information can be found here.